Simple fact - all skydives are awesome and no matter which of the many New Zealand operators you plump for, the chances are you are going to have the time of your life as you race towards earth at terminal velocity - 200 kph/120 mph. So how do you decide which to go with?. Almost universally, New Zealand skydive companies offer photo or video packages as add-ons and also each experience involves between 5 to 7 minutes of serene drifting by parachute after your initial free-fall. Where they differ most is with regard to the height of your skydive and therefore how many seconds of free-fall are involved (12,000 ft gives 45 seconds of free-fall, 15,000 feet gives 60 seconds etc), how personal the experience is (typically dictated by the size of the company) and the scenery you can feast on. Lower skydives come with lower price tags otherwise most of the companies included here have similar basic prices. Where you start to see significant differences in price is in regard to the video/photo options offered. We have narrowed down the list of New Zealand skydive options a little by only including those which drop you over Mother Nature-crafted scenery which falls into the totally stunning category. You must then decide which of the other factors are most important to you. Do you want to bag yourself the highest skydive or are you simply looking for the lowest priced? We have also saved you the headache of working it all out and produced a comparison chart so you can easily compare all operators in one go - see bottom of page. New Zealand's highest peak – Aoraki/Mt Cook – a whole host of other mountain scenery and six lakes are your vista here. Nzone are one of the original tandem skydive outfits in New Zealand which means many years of experience. They are also one of the biggest and busiest companies so although you won't find quite the same personal service as you would with a smaller outfit, you are certainly in the hands of one of the most experienced teams in the country. Anyone who knows anything about the Queenstown scenery will tell you each skydive here is rewarded with scenery as beautiful as it comes. Descending from several thousand feet above the Wakatipu basin – an area of soaring mountains and sparkling lakes – will give you the best view possible of this glorious landscape. 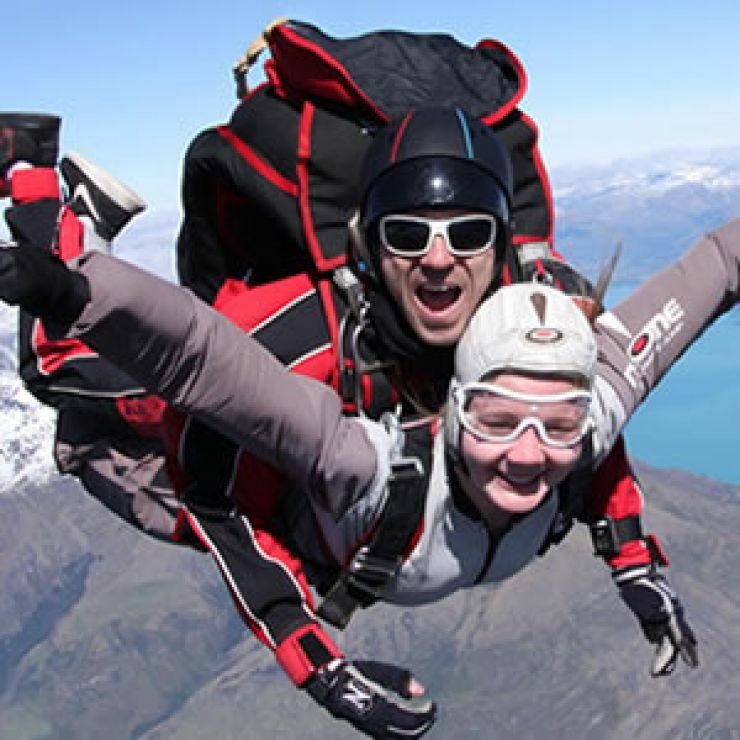 Based in Glenorchy, this outfit - far smaller than Nzone - offers an alternative Queenstown skydive for all those who like their experiences a little more personal. At ground level, the Abel Tasman is already something special but treat yourself to a skydive from here and you get to see those same turquoise seas and golden beaches but with some major extras such as a glimpse of both islands at the same time AND mountains; a real feast for the eyes. This small friendly outfit is probably the pick of the bunch in our view. They were the first of the glacier drop-zone skydive companies and they use their extensive experience (amounting to almost 20 years) to enhance their jumpers' fun. In a country bursting at the seams with glorious landscapes it is sometimes hard to decide which of them offer the most scenic skydive but if you had to pick just one it would most probably be here. Your main backdrop is the mighty Southern Alps with its snow fields and a location which includes New Zealand's highest peak – Aoraki/Mt Cook - but also within view are temperate rainforest, ocean, glaciers, braided rivers and lakes. 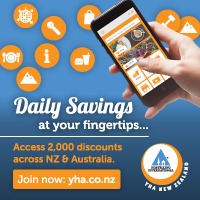 Inclusive freebies: Pick-up and drop-off from Franz Josef township. Another glacier-based outfit, Skydive Franz hold the title of New Zealand's highest possible tandem skydive at 19,000 ft. Your skydive here will show you the same stunning views as the Fox Glacier option but you also get to do your good deed for the day by handing over your money to this company. Opt in for the highest jump and part of your fee is donated to the Kea Conservation Trust. And in case you're not familiar with these incredibly playful and mischievous birds, kea are an endangered mountain parrot species found only in New Zealand. They are also the only New Zealand company which will take jumpers weighing over 100 kg (extra charges apply). Skydives from here drop you over the Tongariro National Park which is home to volcanic moonscapes and snow-tipped active volcanoes. Your bird's eye view will also sweep over Lake Taupo – the Southern Hemisphere's largest lake – as well as offering up coast to coast views of the North Island. 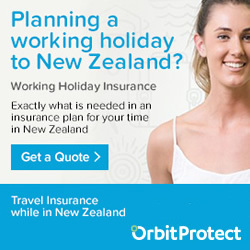 Price: From NZ$388 but this price includes video footage and photos which other companies offer as add-ons. Additionally they have a 'beat or match' price policy which extends to all other New Zealand skydive companies. 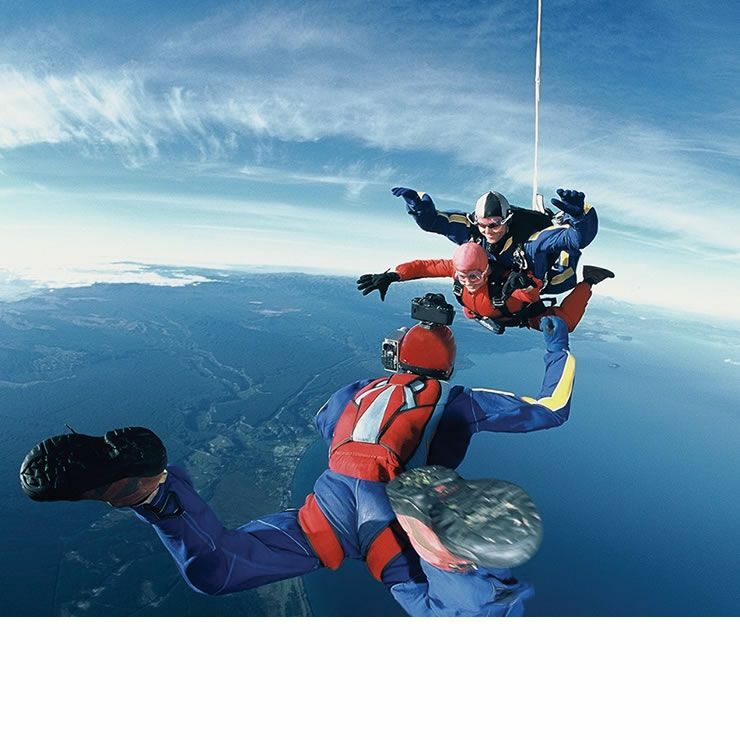 Inclusive freebies: This company is known as one of the best for money-saving deals including an instant free upgrade to their biggest jump if you skydive on your birthday. Skydive Taupo combines the Manaakitanga (the Maori hospitality, and kindness) with the Kiwi thrill-seek attitude. From a courtesy limo ride to a flight in the iconic plane covered in Maori patterns with a pink twist, these guys will knock your socks right off! The breathtaking views include not only the Great Lake Taupo and the spectacular Tongariro National Park, but also – in clear days - the stunning Mount Taranaki to the South, and White Island in the Bay of Plenty. To top it all up, they are the only skydiving company in NZ who let you choose your own soundtrack to accompany your amazing jump footage. Inclusive freebies: Limo tranfer within Taupo and free shuttle from Rotorua. On your birthday, you only pay for the jump – the handycam package is FREE! With Skydibe BOI you not only get some of the best scenery there is but also there is the option of a beach landing as well. Cruise up to 16,500ft and soak up scenery of all 144 islands that make up the Bay of Islands. The spectacular views of clear turquoise water, long stretches of pristine golden beaches and lush countryside are guaranteed to take your breath away. *Price comparison worked out taking companies cheapest skydive only option at 12,000ft. Skydive Fox Glacier & Skydive Franz do not operate a 12,000ft jump but a 13,000ft jump, so prices for these companies have been worked out pro-rata, to give a fair comparison.